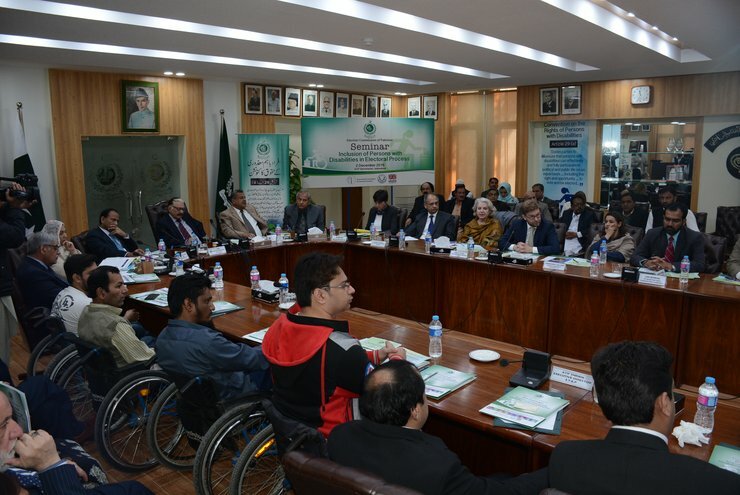 To mark International Day of Persons with Disabilities (IDPD), the Election Commission of Pakistan (ECP) and the International Foundation for Electoral Systems (IFES) held a seminar on the inclusion of persons with disabilities in the electoral process on December 2 in Islamabad. Chief Election Commissioner Justice Sardar Muhammad Raza, Secretary of the ECP Babar Yaqoob Fateh Muhammad, members of the commission, disability inclusion rights organizations and donors participated in the seminar. The theme of this year’s IDPD was “Achieving 17 Goals for the Future We Want,” a reference to the United Nation’s Sustainable Development Goals. IFES began the seminar with a presentation on the Islamabad Declaration (2014) and the Forum of the Election Management Bodies of South Asia’s Colombo Resolution (2015), highlighting the commitments and initiatives made by the Pakistani government, civil society organizations and South Asian election management bodies within the context of the day’s theme. Atif Sheikh, chief executive of the Special Talent Exchange Program (STEP), provided remarks on the disability framework in Pakistan, highlighting the challenges to electoral participation faced by persons with disabilities and raising concern that the upcoming government-led census does not include a question on disability. At the conclusion of the seminar, Justice Raza committed to conducting an assessment of ECP buildings and creating an implementation plan to make them accessible, locating all polling stations on ground floors to ensure accessibility, training ECP permanent staff on disability inclusion in the electoral process, sensitizing polling staff on gender and disability, and ensuring a 2 percent job quota for persons with disabilities within the ECP. The seminar was covered by the local news outlet Dawn. The International Foundation for Electoral Systems (IFES) is an international nonprofit organization that has worked since 1987 to ensure all citizens have a voice, including through their participation in elections. A version of this article can be found on IFES' website by clicking here.